Can People With Celiac Disease Digest Lactase? It's easy to confuse lactase and lactose. You've probably heard of lactose, which is a form of sugar found in milk and other milk-based products. Many people have trouble digesting lactose — that's because they don't have enough lactase, which is the enzyme our bodies make to help us digest the sugar molecule lactose. Your body can't digest and absorb lactose unless the lactase enzyme acts to break it down into two component parts known as glucose (a simple sugar) and galactose (another form of sugar that's actually less sweet than the better-known glucose and fructose). If you don't have enough lactase in your intestines, this process doesn't work to turn lactose into the two smaller sugar molecules. And when lactose doesn't get broken up, it causes problems. What kind of problems? Well, undigested lactose can lead to abdominal cramps, flatulence, and diarrhea. 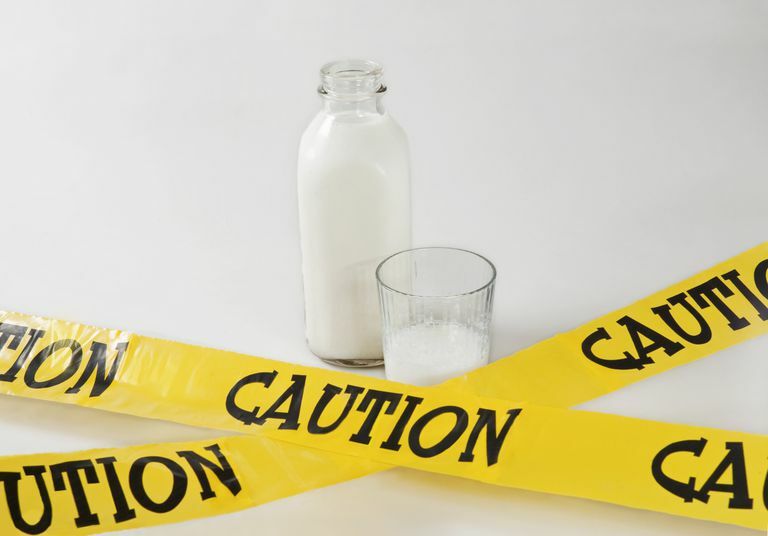 People with lactose intolerance often must avoid milk product (or at least limit them) to keep their symptoms at bay. As an alternative, they can purchase lactose-free milk and other milk-based dairy products. What Does This Have to Do With Celiac Disease? As it turns out, the enzyme lactase is made by the intestinal villi, which are tiny finger-like projections located in your small intestine. When a person has celiac disease, gluten consumption causes their immune system to mistakenly attack those villi, leading to what's called villous atrophy, or erosion of the villi. Once the villi are gone, the body has trouble producing enough lactase. Since your body needs lactase to digest lactose, a lack of lactase can lead to lactose intolerance. Studies have shown that people diagnosed with celiac disease can regain their tolerance to lactose in milk products once they've begun following the gluten-free diet. In all likelihood, this occurs because their intestinal villi's ability to produce lactase has been restored as their intestinal villi grow back. In one study, one person out of 15 recovered the ability to digest lactose (as measured by the hydrogen breath test) within six months of going gluten-free. Nine of the remaining 14 people in the study recovered the ability to digest lactose within 12 months of starting the diet. The researchers noted that "a large proportion" of people with celiac disease seem to revert to being lactose-tolerant (likely because they now are producing the enzyme lactase) after a year on the gluten-free diet. Physicians should test for lactose tolerance to make sure people with celiac disease aren't unnecessarily also lactose-free, the study concluded. It's also possible to have what's known as primary lactase deficiency. This means your genes are to blame for your lack of lactase (and associated inability to digest lactose), not some other medical condition like celiac disease. Ojetti V. et al. Regression of lactose malabsorption in coeliac patients after receiving a gluten-free diet. Scandinavian Journal of Gastroenterology. 2008;43(2):174-7. Can I Donate Blood if I Have Celiac Disease? Does the ADA Cover People With Celiac Disease or Gluten Sensitivity? How Can You Tell if it's an Eating Disorder or Celiac Disease? Can Early Infection in Infants Lead to Celiac Disease?